Interactive live show every Saturday on Radio Active! WILLEMSTAD - The Curaçao Tourist Board (CTB) recently launched a new awareness project called ‘CTB in Your Neighborhood’. The ‘CTB in Your Neighborhood’ project is part of CTB’s awareness campaign ‘Kòrsou ta dushi’. 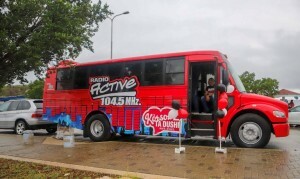 The project includes a live broadcast radio show from Radio Active’s Mobile Studio informing the community about the island’s tourism areas, with a number of quizzes and prizes for the audience and listeners.